NEW YORK, Oct 29 2015 (IPS) - Women are having fewer than two children on average in 83 countries, representing nearly half of the world’s population. 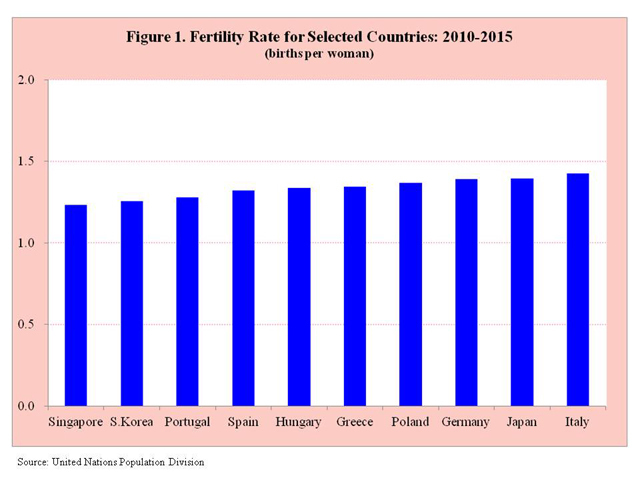 And in some countries, such as Germany, Italy, Japan, Poland, Singapore, South Korea and Spain, average fertility levels are now closer to one child per woman than the replacement level of about two children (Figure 1). Largely as a result of women’s reproductive decisions, the populations of 48 countries are projected to be smaller and have older age structures by mid-century. Looking further ahead, the prospects for those countries are compounded over time resulting in even smaller and older populations by the close of the century. For example, if Japan’s fertility rate of 1.4 births per woman were to remain unchanged, its current population of 127 million would be 64 million by 2100 with more than 40 percent of the Japanese aged 65 years and older. 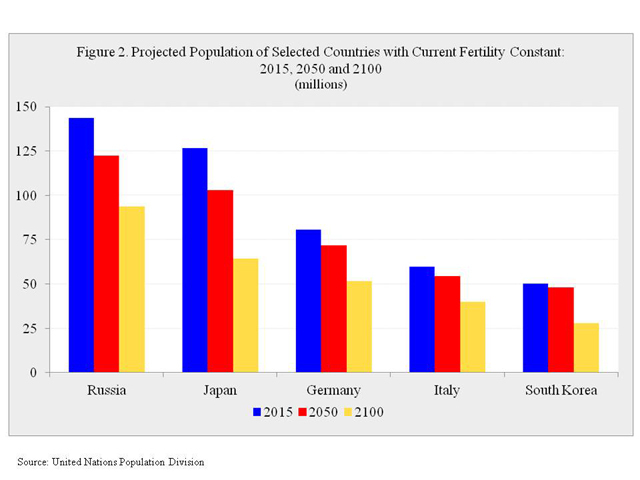 Similar demographic outcomes occur in many other countries when low fertility levels remain unchanged, such as Germany, Italy, Russia and South Korea (Figure 2). Based on the demographic trends observed over the last five decades, once birth rates fall below the replacement level, especially when less than 1.6 births per woman, they tend to stay there. And even if birth rates were to increase somewhat, the pool of women of childbearing age in many of the low fertility countries is shrinking, resulting in fewer babies being born. Although relatively little supporting empirical research exists, countries tend to view demographic decline and population ageing as critical concerns. They believe those demographic trends will have serious repercussions on national interests affecting economic growth, military defence, cultural integrity, pensions and health care, especially for the elderly. Some governments, including Germany, Italy, Japan, Russia, Singapore and South Korea, have concluded that intervention efforts are needed to raise their country’s birth rates in order to stem the projected decreases and rapid aging of their populations. Most recently, those twin demographic concerns have led China to announce that it is abolishing its one-child policy in favour of a two-child policy per couple. However, despite government policies, considerable financial expenditures and various pronatalist initiatives, including national conception day, family night, “love cruises,” match-making, economic incentives, promotion of motherhood and appeals to patriotism and civic duty, efforts to raise fertility back near the replacement level have generally failed to convince women to have more children. In many low fertility countries birthrates have remained well below replacement for decades. There are many factors or reasons why fertility levels have fallen below replacement and continue to persist at low levels. Marriage as a valued social institution has declined with divorce and separation becoming more common and acceptable. Also, marriage is no longer being viewed as just for reproductive purposes. Opportunities for education, employment, mobility and financial independence, together with effective contraception, permit women to delay or forgo motherhood altogether. In many developed countries, especially in Europe, 10 per cent of women in their forties are childless and even in some, such as Germany, Italy and the Netherlands, the number is close to 20 per cent. Also instead of marriage many women and men are choosing to cohabitate, thereby avoiding legal issues, social responsibilities and long-term commitments. Even if they subsequently decide to marry, many are content to continue with their partner just as a couple. Growing numbers of young women as well as men are choosing personal self-fulfillment and career development rather than centring their lives on family and children. After years of being without children, many have become accustomed to an urban life style, higher social and economic status and unrestricted freedoms. Also, many young couples find that they cannot live on one person’s income alone and therefore both are obliged to work. The additional costs of children plus the need to save for longer years of old age place increased financial demands on household income as well as exerting powerful brakes on childbearing. Another compelling factor accounting for low fertility in many countries is the lack of sufficient support and social services for those with children, especially single-parent families. That issue has become particularly salient given the fact that the majority of women are no longer simply mothers but are working mothers. The demands of employment, career development and parenting combined with the costs of childrearing have also created “the hurdle of the second child.” Given those pressing circumstances, especially as childcare still falls largely on women, many mothers are reluctant to have a second child. Even if some women decide to cross the second-child hurdle, comparatively few are willing to consider having three or more children. Some women as well as men have limited their fertility due to concerns about global overpopulation and its damaging consequences on the natural environment. They are convinced that the world would be a better and more sustainable place to live with low birthrates, which would in turn lead to a smaller future global population. Government policies and schemes to encourage women to have more births in order to stem population decline and ageing have also encountered resistance and objections about unwarranted government interference and meddling in women’s lives. In Germany, for example, the recent introduction of a childcare allowance for stay-at-home mothers was harshly criticized for discouraging women to pursue careers as is widely promoted and expected of men and fathers. Will governments be successful in persuading women to call off their reproductive strike and have significantly more children, thereby perhaps raising fertility rates to near the replacement level? It seems highly doubtful. Based on their current behaviour and what they’re reporting, women in low fertility countries are not likely to increase their reproduction for the sake of the nation, limited financial incentives or other governmental pronatalist schemes. Most young women have decided not to return to the traditional, restrictive reproductive roles that their mothers and grandmothers followed. Consequently, for the foreseeable future, birthrates in low fertility countries are likely to remain below the replacement level.